Every year, around this time, food writers fill thickets of pages—actual printed pages or virtual pages like this one—with recipes for turkey. There are traditional New England turkeys, stuffed with bread and sage and onions and studded with everything from sausage to chestnuts. There are southern turkeys, with dressings made from cornbread that never visits the nether regions of the accompanying fowl. There are instructions for deep-frying, replete with warnings about all the terrible things that can befall a neophyte attempting to prepare the bird indoors. There are endless instructions about the proper way to thaw a giant turkey—and phone numbers to call if, on the morning of the Big Day, readers discover that they have neglected a task that should have begun three days earlier. Certainly, those people who have never prepared a Thanksgiving dinner might benefit from the experience of others. However, the idea that experienced cooks might actually try one of the countless new recipes for the holiday is fundamentally flawed. 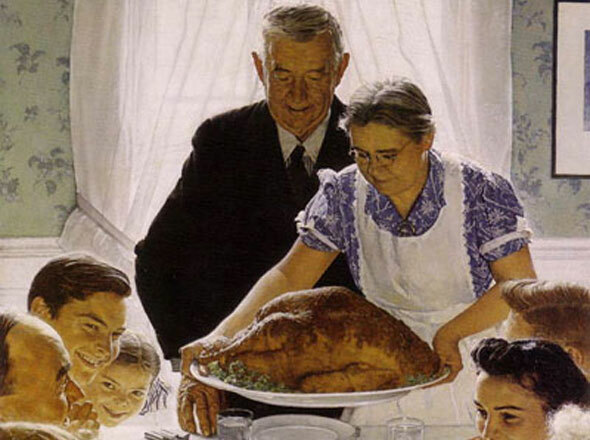 Think about it: Thanksgiving is one of the most traditional meals of the year. During the rest of the year, zany combinations and concoctions are fair game, but on this, the holiest of holy culinary days, traditions stand firm. Which is why editors pull their hair out trying to come up with something new. And while the holiday itself has been officially recognized only since the Civil War, it’s part of a harvest tradition that’s at least as old as agriculture itself, which is, give or take, some 10,000 years. The turkey part is somewhat newer—it dates to the colonization of the New World in the seventeenth century—but the idea of serving meats with fruit, as we serve cranberries with turkey, was popular in Europe during the Middle Ages. The spice mixture that creates the characteristic scent of most pumpkin pie (cloves, nutmeg, and ginger) are also Medieval favorites—and were traditional even then, though the tradition was borrowed from Arabic traders and medical writers. This stuff is in our DNA. When we pull up to the holiday table, we expect to be comforted by really familiar flavors and aromas. Most families would be horrified to discover that the cook had decided, willy-nilly, to mess with their traditions by indulging in all these fancy new dishes splashed across magazine pages. Some of these articles serve a purpose, beyond filling all that dead space between ads. Some readers may not be saddled with family traditions and may be interested in try something new. Some may be dreading yet another dried-out turkey—and are willing to try anything, once. Some may have just recovered from the experience of Thanksgiving past and want to banish the specter, once and for all. In any case, you won’t be getting any turkey recipe from me. I will, however, steer you to a discussion of another troublesome part of the Thanksgiving experience: the somewhat bizarre, yet fully expected, utterly 20th-century combination of sweet potatoes and marshmallows. © 2008 Gary Allen. All rights reserved.